All month long Gala Casino is running a promotion which offers you a 25% profit boost or 25% cashback when playing roulette or blackjack. The promotion guarantees you a bonus of up to £100 regardless of the outcome of your bet in what is a win-win situation for players. 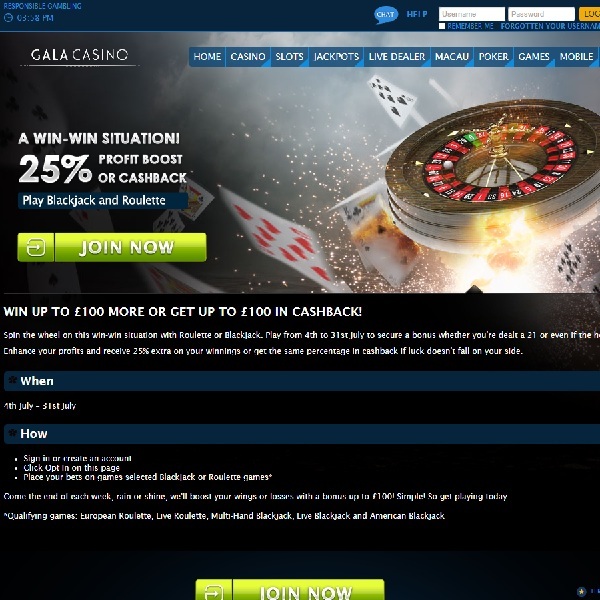 Simply head over to the casino and opt in to the promotion. Then play the selected blackjack or roulette games and at the end of each week the casino will boost your winnings by 25% up to £100 or give you cashback on losses of 25% up to £100. The selected games are European Roulette, Live Roulette, Multi-Hand Blackjack, Live Blackjack and American Blackjack. This is the perfect opportunity to explore these games so head over to Gala Casino today and start playing and at the end of this week you know you’ll be winning money.